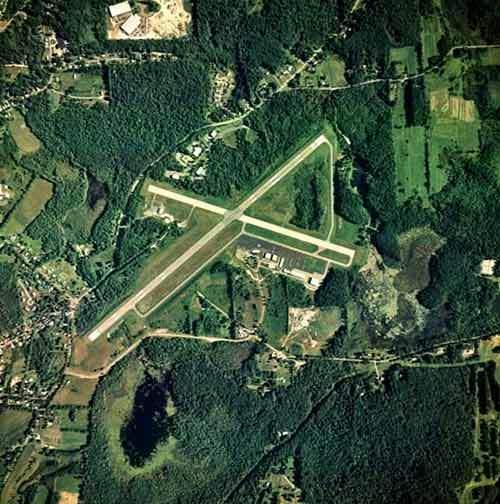 Aerial view of Pittsfield Municipal Airport. Aerial photograph of north-south and east-west runways. 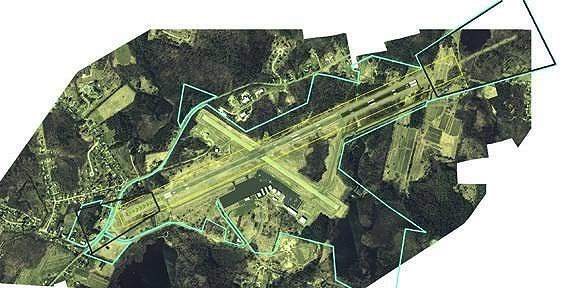 Photograph showing the planned airport expansion. 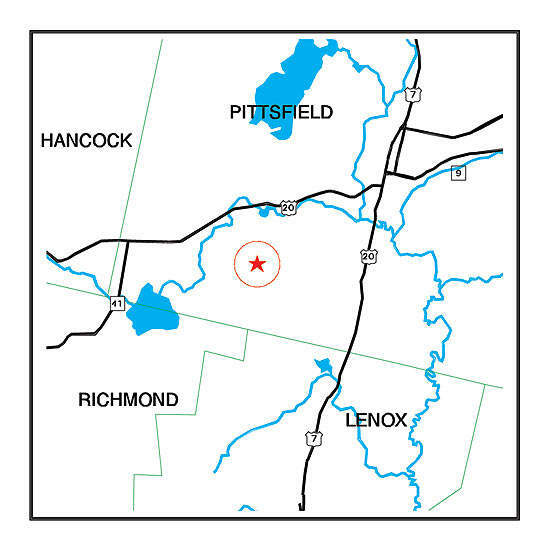 Map showing location of Pittsfield Municipal Airport. 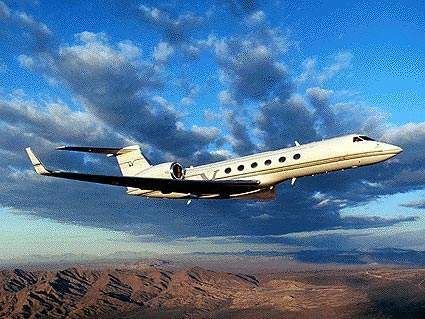 Gulfstream V corporate aircraft, the largest plane the airport can accommodate. Pittsfield Municipal Airport is undergoing a major renovation and upgrade. The project started in April 2001 with a consultation period to determine which facilities required upgrading or construction. A plan of action was formulated by May 2001 and grants were applied for to Federal Aviation Administration (FAA) and Massachusetts Aeronautics Commission (MAC). The first and most important upgrade to the airport is the extension to the length of the runways by 1,000ft to comply with new FAA standards. The runway extensions will allow larger aircraft to land more safely and allow the airport to handle aircraft during adverse weather conditions. The second problem was the size of runway safety areas, which did not satisfy FAA regulations. Other facilities at the airport requiring upgrading are the approach facilities and the terminal building. The Federal Aviation Trust Fund and the Massachusetts Aeronautics Commission (MAC) are to pay almost the entire cost of the runway improvements, totalling some $20 million. The aviation trust is to pay $7.3 million from a general ‘User’ fund accumulated from fees paid by airport users throughout the United States. MAC is to pay $11.4 million through a transportation bond raised with approval from the Massachusetts legislature. In addition, the City of Pittsfield is to contribute $1.1 million from city funds for the runway upgrades and will make an additional $2 million available for other infrastructure improvements. The 300-acre airport has two paved and lighted runways, aircraft taxiways and ramps as well as ten hangar buildings; there is no designated passenger terminal building. There are two full-time Fixed Base Operators (FBO) – Curtis Aviation and Maine Flight Centre – both of which operate from private land adjacent to the airport and who provide passenger/pilot facilities and services at the airport. The airport does not have an air traffic control tower; the runways are controlled by FBO representatives on the ground using UNICOM radios to communicate with pilots and each other. Approach and departure control from the airport is controlled by Bangor flight service station. The main 5,000ft runway (1-19) has three instrument approach systems and an automated weather observation system providing real-time data for approaching pilots. 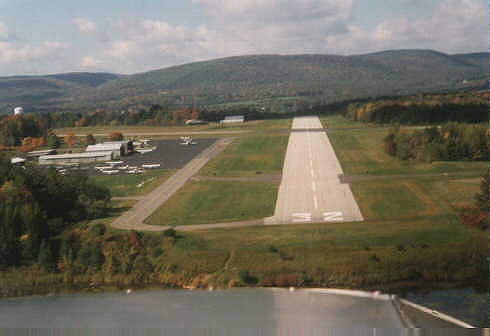 The two runways at Pittsfield are unable to accept heavy passenger aircraft; the paving is only strong enough to take corporate jets, the largest of which would be the Gulfstream V.
The 3,500ft east-west runway (10-28), which has not been regularly used since 1985, will be strengthened for use as the primary runway while the main north-south runway (1-19) undergoes a 1,300ft extension to satisfy new federal requirements. In addition, the main runway is also to have a safety area of 1,000ft built on each end to satisfy the federal authorities. Taxiway ‘B’, which joins the two main runways, is expected to be repositioned and reconstructed by December 2004. The main runway (1-19) will have a parallel taxiway constructed adjacent to it. The terminal building will have 5,000ft² of floor space and a 100-space car park; there will be new road access to the terminal as well. A new aircraft apron of 6,400ft² will be constructed along with two ten-unit nested ‘T’ hangars and two conventional 10,000ft² storage/FBO hangars with space for 25 aircraft. The terminal complex will also include a small business and industrial development park. These developments are due to be constructed on a yet-to-be-acquired 122-acre site adjacent to the existing airport facilities. The runway improvements are scheduled to be completed by December 2006 and the terminal building by 2009. Cross-winds are a significant factor in the airport’s use and consultants and federal representatives have suggested that the orientation of runway 1-19 could be improved to allow aircraft to make more use of the airport. The airport is also due to have an upgrade of the runway approach instrumentation, new sewerage and water lines and a dedicated city-owned terminal building for passenger services. The runway extensions will allow aircraft to land more safely in unfavourable weather, allow corporate jets to fly non-stop to and from the west coast and allow airport use on a year-round basis. The runway approach instrumentation will enable aircraft to approach landing from higher altitude and thus decrease power earlier and cause less noise pollution. The Airport Master Plan Update was formulated in 2001 by the Pittsfield Airport Commission (PAC) and their consultant, Dufresne-Henry a Portland-based company specialising in aviation engineering. The Master Plan was put into action by funding requests to FAA and MAC and by mid-2003 funds had been allocated for the project, including an initial amount of $2.6 million from the FAA (only a fraction of the $7.3 million which will eventually be provided). The construction project for the runway extensions was put out to tender in early 2003. The winning bidder and contract holder is Frank W. Woodworth of Detroit. The contractor gave a price of $2.23 million to refurbish and extend the primary runway and also to mark it out and install a new runway lighting system (with higher intensity lights than previously). 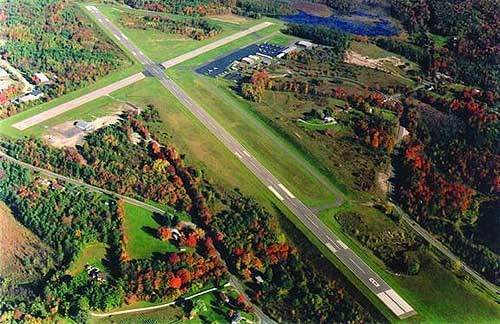 In addition, the city of Pittsfield has retained Hoyle, Tanner and Associates of New Hampshire (consulting engineers required by FAA rules) to design and plan the runway renovations, oversee construction and liaise with federal and environmental authorities for the necessary permits for planning and construction. The main runway will have a new lighting system installed to comply with the latest federal regulations. There will be high intensity edge lighting and Runway End Identifier Lights (REIL) along with Precision Approach Path Indication (PAPI). The precision approach navigational aids will also include a Medium intensity Approach Light System with Runway alignment indicator lights (MALSR). The Visual Approach Slope Indicator (VASI) is also due to be relocated for better visibility. $100,000 of funding is being allocated for the development of a sophisticated airport security system. The first part of this will be the installation of surveillance cameras in the terminal building and at each of the main access gates. The cameras will also be supplemented by a remotely controlled robotic camera (with low light infrared capability) overseeing the aircraft parking apron. The second part will be the access control system, which will control access through all doors and provide the secure side of the airport. The system will be a card reader and will be fully compatible with the MAC photo identification system. The third part will be a digital recording system to allow unlimited save space for the data produced by cameras. The system will also be Internet compatible, allowing observation by Pittsfield police remotely from the police station.